Three exams, two research papers, and one lab practical later . . . Yes, it’s official. I am done with midterms. Let me tell you, the nap I took after writing for nearly two and a half hours for my History of Public Health midterm was the epitome of bliss. I’ve taken quite a few naps in my college career, and that one definitely belongs in the top three. The public health courses I’m taking are so much more challenging than any other class I’ve taken before. It can be grueling at times balancing school, and work, but I’ve managed to take away two major lessons from my first set of midterms as a student at USG. I’ll share with you this inconvenient habit of mine. Whenever I feel overwhelmed about everything I have to do, instead of, I dunno, getting started on my to-do list . . .
No, I don’t scroll through social media. No, I don’t take selfies. I lie down! Couch, bed, floor, you name it. I lie down, and think of everything I still need to accomplish, which is basically the least productive thing I could possibly do. And then there are people on the opposite side of the spectrum who feel as though their world is disintegrating under their feet with each, and every assignment that comes their way. Whether you turn into a zombie like myself, or are constantly on the verge of a panic attack, calendars, and lists can come to the rescue. Having an idea of what to expect throughout the month keeps me sane when my work life, school life, and social life (or lack of) gets out of hand. I literally write down every assignment, appointment, due date, deadline, meeting, anything, everything, ALL THE THINGS. Here’s an example of just one of many calendars that I use. It’s colorful. It’s bright. And yes, it’s effective. So, I haven’t gotten my grades back yet, but good, or bad, I’ll be satisfied knowing that I did my best. Not that getting A’s on my exams wouldn’t make me the happiest person on campus, or anything . . . But, I’m sure we’ve all been there. You spend hours preparing, studying, and memorizing, then you get your grade back, and you’re just like, UMMMMM. Those are the times when confidence really matters. Now, I’m not saying you should purposely not study, but you need to know you have the resiliency to get past any unexpected hurdles that come your way. So, congrats to those of you who have survived midterms. And a bigger congrats to those of you who don’t even have to take midterms. This semester has really flown by, and we deserve to celebrate! I know I have! Not only with a nap, but with this. YES. 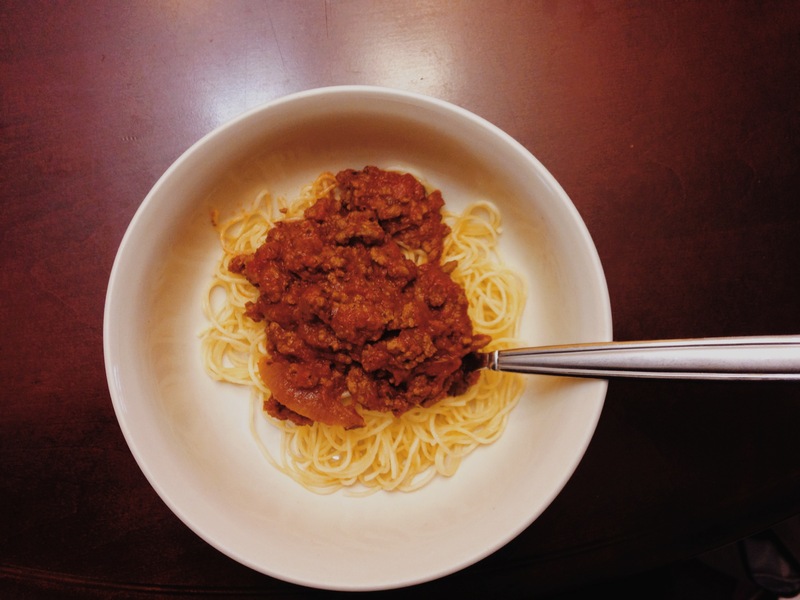 A bowl of hot, home-cooked, yummy spaghetti. I know what you’re thinking. This girl really knows how to party. Your girl has been accepted to participate in UMD’s Alternative Spring Break Trip to South Carolina! Holla! Can’t wait to tell you all about it when March rolls around. Hope you enjoyed this glance into the life of a student around the grove. Hi, guys! My name is Dilani. This is my final year as a University of Maryland, College Park student, and blogger for Around the Grove. Fantastic inaugural blog post! It makes me want to get a one-week calendar like the one in your photo. Congrats on surviving the History of Public Health exam! 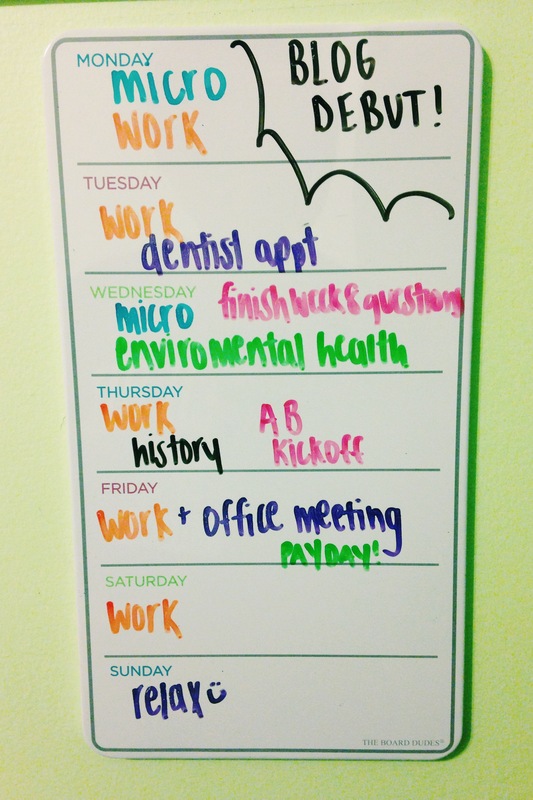 Also, I love the neon dry-erase board markers that you used on your calendar. I’m super jealous of those! Lol, History of Public health was one of my favorite classes. Thanks to Dr. Boyle, he teaches that class with passion. Congrats on getting into the ASB! I really want to do that next year! Thank you! And you should definitely apply. I went on an ASB trip through Montgomery College to Tuscaloosa, Alabama last year and it was seriously one of the greatest experiences of my life.